I noticed myself incorporating more and more paperclay into my art doll figures. This shift in medium has been gradual. I think that it has been influenced by two main factors. I’ve increasingly given myself permission to edge away from my copper sculpture roots, and I don’t feel as obligated to have metal present in every piece. 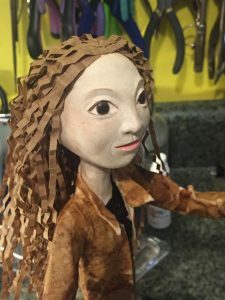 Figures with hand wrought copper faces were the launching point for my art dolls, but I have allowed them to grow and evolve as all my work has over time. My work has become almost exclusively figurative, I want to explore and refine the elements of that type of sculpture. 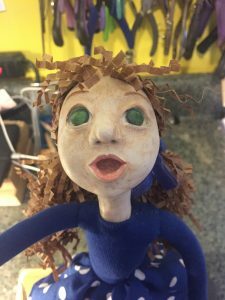 Working with paperclay facilitates my ability to develop facial expression beyond the more mask-like visages of my earliest dolls. I decided to take some “selfies” of the pieces that were sitting around the studio this morning. As you can see, all three of these art doll sculptures have faces that I sculpted in paperclay. Blank Pages is a seated figure contemplating the pages of the journal/sketchbook in her hand. “Pages” has her pencil in hand, and is captured in that moment before free reign is given to creativity. She does have several predecessors in my gallery archives. There is a portrait piece and a couple of commissions within that number. This is obviously a theme I enjoy returning to. 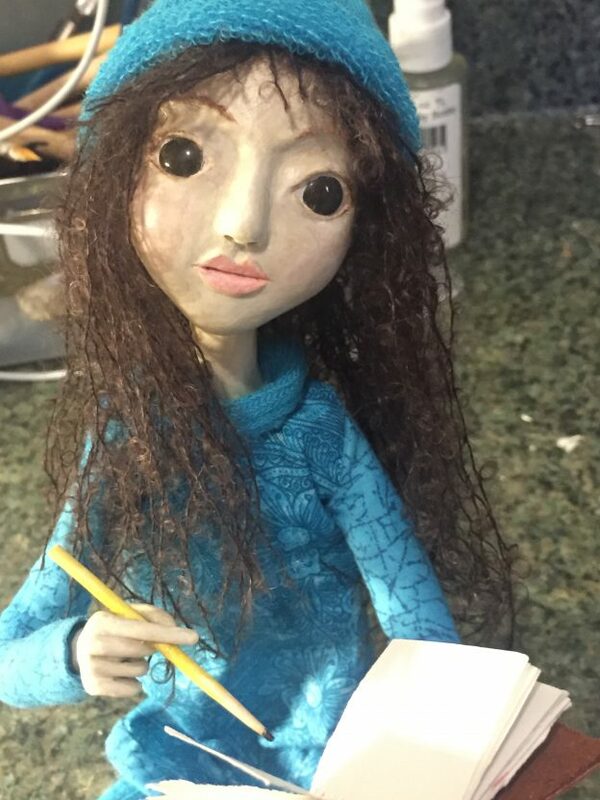 This second doll selfie is the face of a recent commission piece. As she will soon be a gift, I can’t divulge any details about who she is, or what she is doing. I can tell you that her task involves deep thought and concentration. She certainly looks focused on what she’s doing. You can see how the choice of media has allowed me to expand what I can incorporate and capture in the faces of my art dolls. This entry was posted in Art Dolls and tagged art doll, figure, figure sculpture, mixed media, one of a kind, OOAK, sculpture on April 8, 2017 by lynnadmin. The faces are so expressive. Very nicely done!